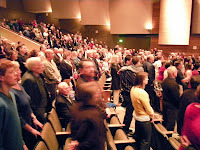 The Lord blessed New Life Church on Sunday when we were together with New Life Oregon City at West Linn High School. 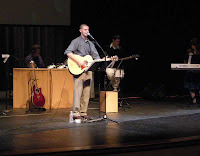 The singing was inspiring and the response to God's word was sincere and heartfelt. Some things happen when you put multiple congregations together that are unique. All of us realized that God is doing something bigger in our midst than we experience week-to-week. One woman from Oregon City discovered that her boss went to church in West Linn. We had two different high school reunions, one from Canby and another from West Linn. Classmates saw each other for the first time in years. Thanks to those who served behind the scenes with children and refreshments, ushering and parking. I trust the Lord will continue to raise our sights for what He wants to do through us. I bet that was a really great morning! I would have loved to have been there!